"This page is badly out of date with current news." This section of my site is about my favourite band. They reformed in 2011, just as I am about to tell you they split up.So bear with this page and read on in later section about their reformation. The next paragraph will sound a little confusing but when you read the beginning of Suede in 2011, it will all make sense. Actually they have now split up but as I still remain passionate about them, these pages will continue. Just pretend, initially, that I am writing as if they still exist, it will be too difficult to change the entire section. The original band has changed so much since their beginning, so instead of rewriting, I will just add all new line-ups and the music as it happens. 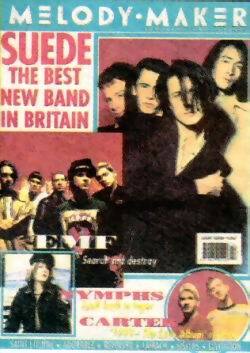 (Two members of Suede, Mat and Brett were once in a band called 'Suave and Elegant', hence the site name.) So from the next paragraph, the story remains the same! Circa 1992, Suede are commissioned as the best new band in Britain, reintroducing a swaggering, sparky substance and style of music, with a hint of arrogance and androgyny. Not celebrated for some time, it gave hope to a new British sound which would banish baggy and shoe gazing into oblivion. This promo video is 'The Drowners'. Their first singles release. Yet as soon as Suede had the Rock Gods of music shining upon their success, they were seemingly to tumble into obscurity with tail lights diminishing into the dark. After an extremely successful eponymous debut album: followed by the explosive, angst ridden orchestral delight of Dog Man Star in 1994 the band were in danger of dissolution after the departure of guitarist Bernard Butler.The music world assumed this was the end of Suede. This is a live video I found of my favourite song called 'Still Life' from the second album. Listen to it as you scroll down this page. It is the most beautiful song ever. And although the acoustic version is perfect, you must listen to it with The Sifonia of London Orchestra. Richard Oakes is now playing guitar. Original band member bass guitarist Mat Osman, and Drum Machine replacement (thank God), Simon Gilbert form the tight rhythm section who will let loose with a cyclonic swell of enthusiasm as circumstance requires. Mat is the dark brooding giant in the background until a dynamic bass charge drives him into the front line and Simon, known as the most open and so it's been said, friendliest band member, drums with enthusiastic, funky professionalism, keeping the band in check. Lead guitarist replacement Richard Oakes proved he was no slouch in the starmaker role, wreaking love and poison with his swanky, melodic, articulate riffs, restoring a balance within the band after Butler's defection. With his newfound self-confidence, he has developed his own flair and stage presence. The next recruit was Neil Codling, cousin of Simon. Simply put, the Lounge Lizard; King of Cool. This elegant creation of cheekbone, who plays a deft piece of piano, adds the definitive touch to the backing vocals and gives a hitherto unknown addition to the exuberant, antagonistic yet classy sound built upon sheer brilliance. Unfortunately, due to his long-running battle with chronic fatigue syndrome, Neil decided to leave the band in January 2001, concerned that his illness was getting in the way of their gigs and the next album. Finally enter Alex Lee, a member of the now defunct Srangelove, who joined Suede after Neil left. The two bands had toured together, with Brett and Richard making guest vocalist appearances on the Strangelove Album, Love and Other Demons. He initially began appearing with Suede in 1999, when Neil's illness prevented him playing. Alex plays guitar, harmonica, piano, organ and synthesiser. He can also provide backing vocals and has co-written new songs with the band. Brett is hoping that Alex's style will add a different sound to the band's next album.